Halsted bus #8 at Willow. Red Line at Clybourn and North Avenue. Since its doors opened in 1988, Gianni Delisi’s family-run Italian trattoria has flourished as a mainstay on the Chicago restaurant scene. Enhance your dining experience and opt to sit out under the stars in our NEW 96 SEAT AL FRESCO DINING AREA - NOW OPEN! Trattoria Gianni's menu features a diverse selection of regional Italian cuisine, augmented with superb daily specials and an array of delectable desserts to delight your palate. Gianni's boasts an extensive wine list, a full bar and a special selection of grappas. The restaurant has been awarded 3 stars from the Chicago Tribune, 3 1/2 stars from the Chicago Sun Times and has consistently received excellent ratings from Zagats. Located in the heart of the Lincoln Park theatre district -- directly across the street from Steppenwolf theatre and a few doors north of The Royal George -- Trattoria Gianni's has long been a dining destination for theatergoers before and after the shows. Caponata, zucchini, roasted bell peppers, artichokes heart, mushrooms, olives & fontina cheese. Raw thin-sliced filet mignon, olive oil, lemon, arugola, shaved parmesan cheese. Saffron risotto balls, stuffed with bolognese, peas & scamorza cheese, fried and served with fresh marinara sauce. Grilled polenta, wild mushrooms & melted scamorza cheese. Fried calamari served with a side of marinara sauce. Mussels sauteed with olive oil, garlic, fresh herbs, tomato broth & garlic crostino. Roasted eggplant baked with tomato sauce, goat cheese, basil, black olives. Toasted Italian bread, chopped plum tomatoes, garlic, basil and extra virgin olive oil. Fresh seasonal soup, prepared daily. Small meat tortellini in a chicken broth. Romaine lettuce, tomatoes, cucumber, carrots, red radishes in a red vinegar olive oil dressing. Tuscan kale, baby spinach, caesar dressing, polenta croutons and shaved parmigiano. Mixed baby lettuce, sliced apples and pears, caramelized pine nuts, mixed goat and gorgonzola cheese in a herb vinaigrette. Tomatoes, fresh mozzarella, basil and extra virgin olive oil. Fresh spinach sautéed with garlic, olive oil. Roasted potatoes with garlic and rosemary. Escarole sautéed with garlic, olive oil and sausage. 1/2 portions of pasta available. we offer Gluten free & Whole wheat pasta, ask your server. 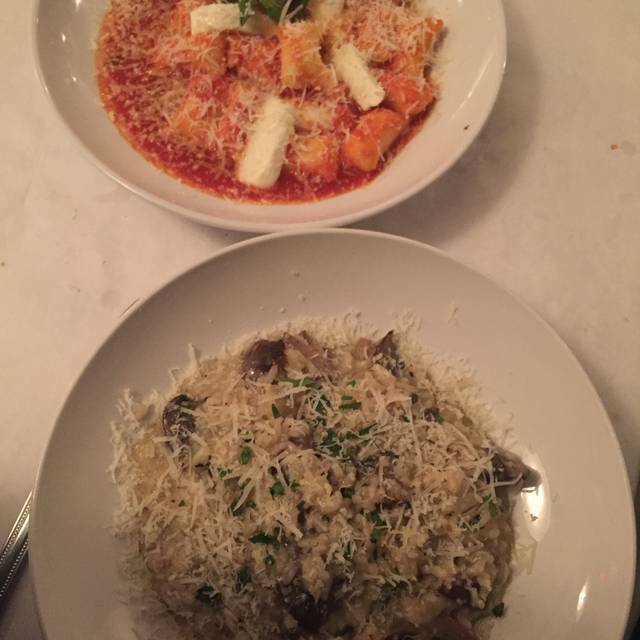 Italian arborio rice with wild mushrooms, white truffle oil and parmigiano cheese. Home-made tagliatelle with Bolognese sauce, pecorino cheese and basil. Hand-made stuffed ricotta gnocchi, tomato sauce, basil and fresh mozzarella cheese. Sun-dried tomatoes, mushrooms, olive oil, garlic, basil in a cream sauce. Home made spinach ravioli, stuffed w/ ricotta cheese, burned butter, sage & parmigiano. Prosciutto, mushrooms, peas in a cream sauce. Crumbled Italian sausage, mushrooms, green peas, tomato sauce, a touch of cream, and scamorza cheese. Scallops, shrimp, cherry tomatoes, olive oil and garlic. Fresh ripe tomato sauce and fresh basil. Mussels, clams, calamari, scallops, scampi, tilapia, fresh herbs & tomato broth. Veal scaloppine,prosciutto and mozzarella cheese, white wine, a touch of tomato sauce, served with sauteéd mixed vegetables. Grilled filet Mignon, Wild mushrooms. Barolo sauce, roasted potatoes. Grilled Duck breast with portobello mushrooms, onions, plum tomatoes and balsamic vinegar served with pan - seared Polenta. Flattened 12 oz. pork chop, olive oil, garlic, parsley and bread crumbs, grilled served with roasted potatoes. Grilled chicken breast marinated in olive oil, garlic, fresh herbs and a touch of balsamic vinegar served with sautéed spinach and mushrooms. Roasted half chicken, disjointed, sauteed with olive oil, garlic, rosemary, roasted potatoes. It is always a pleasant experience to be at Trattoria Gianni. We enjoy a great deal and we love the ambience of the place. Looking forward to many happy returns. Amazing food, it felt like I was back in Rome. Great service and delicious wine list. We have been dining here for many years, pretty much since it opened. The quality of the food is great and always reliable. I was quite pleased to learn that whole wheat pasta is available with some of the dishes. This is important to me because I shouldn't eat regular pasta due to my diabetes. Due to this, I have put this restaurant at the top of my list when I am interested in pasta. Service was excellent. Timing of food was great. Food was disappointing and expensive. Don’t be in a rush, a bit slow between appetizer and the main meal even with the restaurant only 1/2 full. Food good, but now something I would rave about... I have had mush better. Our service was impeccable. The wine choices were appropriate for the entrees and appetizers. We found unique and delicious Italian wines. We are so glad we found the restaurant and look forward to coming back many more times. My second time here. Both good experiences. I recommend this place! The pace of the meal is yours to choose. We enjoyed a paced 2.5 hour meal touring every corner of the menu. Our service person was very patient while we selected the wine that balanced flavor and price. The shaved filet mignon melts in your mouth and has pronounced beef flavor, and savory bits of cheese made it pop. The two salads were flavorful. Mozzarella was light and the basil was fresh. A hint of salt and pepper makes your mouth water. Gorganzola and balsamic balanced the pear and apple slices. Ravioli was amazing. Try it. The veal scallopine had tender veal, savory prosciutto, and married with mozzarella. All together those individual flavors became even better. Yes, I like the food and service here. Celebrated a friend’s birthday! It was perfect. Would definitely go back again! Hopefully the night we went was a fluke. Have gone fir years and food delicious; service good. But not Saturday night. Will go back. Always great! Our favorite Italian restaurant! THE BEST Italian food/dining experience we have ever had. We were in town for 3 days to celebrate our anniversary and we ate dinner here TWICE. Robert was an excellent server, the bruschetta, truffle risotto, and tiramisu were outstanding. It will not disappoint, we will be back here on our next visit and every visit to Chicago after that! We loved everything about it! Would definitely go back! Quality of food was not worth the price. Seasoned to heavily. After many years of visiting Tratoria Guani before Steppenwolf, I am sorry to enter this review. PORTION SIZE has changed so dramatically that all of us LEFT HUNGRY. This, after everyone in our party had a starter and full entree, as well as dessert. After theater, we actually went out for a second dinner. Nice place for after -theatre and great service is always pleasant. As always, great service, great food, Maria is amazing as well as Gianni. Perfect for pre/post theater dining. Very nice comfortable place. We had the specials and everything was surprisingly good. I had wild boar pasta. The pasta fresh and perfectly prepared and the sauce was a nice surprise. Very friendly wait staff and all recommendations were spot on. We'll definitely return. My sister and I went there to celebrate a birthday and our waitress was wonderful, the food was wonderful, The ambience iwas wonderful… We will definitely be going back again. This is a great location for the Royal George Theater, where we saw Woman in Black. The waiter was attentive and the service matched the need to get to the theater. The Branzino was delicious and the entrees were all excellent. I am biased. This was where I took a girl for our 1st date in 1993. She spilled red sauce on her white blouse and didn't have a conniption. 25 years of marriage and 2 kids and we still look to Trattoria Gianni as a place to have a great meal and celebrate whatever the reason. Great food and atmosphere, reasonable prices, neat area to walk the neighborhood. 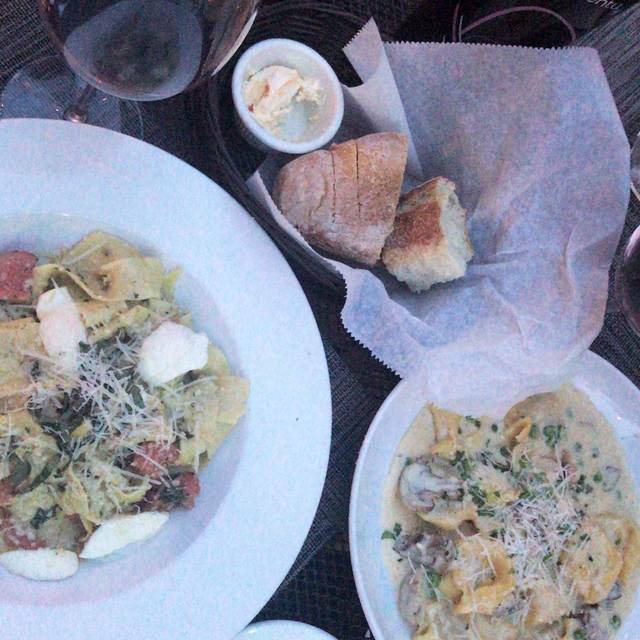 It feels like an Italian restaurant ought to, not pretentious, just really good food and every time on leaving we are glad that is where we went. Just a great little restaurant. This place is our new Saturday night go-to restaurant! Authentic & delicious Italian food, cooked & served by real Italians. Great for pre-theatre meal, near the Royal George & Steppenwolf Theatres. My husband and I took my mother to dinner after a play. This excursion was one of our Christmas gifts to her. There were so many options on the menu that she liked, she had a hard time choosing, and selected a couple of small plates so she could taste a number of things but not feel too full- she enjoyed warm bread and butter, lentil soup and two appetizer-sized portions: two arancini and four small and absolutely delicious veal meatballs- all with extra sauce and cheese, her favorite! She had enough to take a portion home for lunch later in the week. My husband and I enjoyed spinach ravioli in sage butter sauce and grilled branzino. Service was impeccable and warm. The price was reasonable. We left very happy and will return! Delicious food, good wine selection and great service. Dining room gets a little crowded when they’re full but the food is definitely worth it. 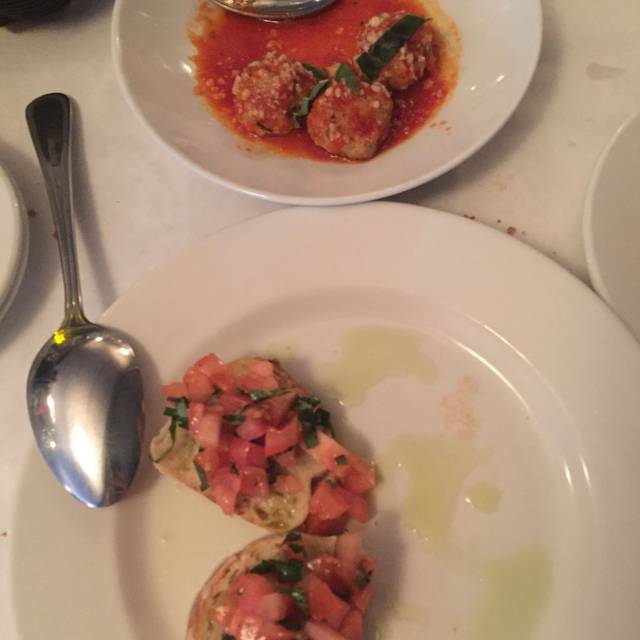 We had a bad experience at Trattoria Gianni ten years ago—forgotten order, poor service, late for our play, etc.—and have avoided the restaurant for many years, even though we live in the neighborhood. We decided to give them another chance recently as we were seeing a play nearby at the Royal George Theater. This time we had a wonderful meal with great food and fine service. We look forward to welcoming this place back into our rotation and to much good food to come. The food and the wait staff were excellent. It is good to know the manager or the man at the door. He was so nice and friendly to people he knew. we were not treated by him in any friendly way. I came back and asked him i=if I left something at the table and he was actually quite brisk. I guess you are a peon if he doesn't know you. Left a bad taste in my mouth. I ordered the pasta on the special menu with mushrooms and pecorino cheese - it should have been called soup, not pasta - swimming in some broth or so,etching, it was awful - wanted a second glass of wine tried to wave down several people including server, couldn’t get them - bad service and bad food! We went here before going to a play at The Royal George Theater and boy was it a treat! Our waiter Matteo was delightful and made great suggestions. The Burrata with crostini (not on the menu) was great, the lentil and minestroni soup (also not on the menu) tasted like my nonna's. My entre Conchiglie del Mercante (shell pasta, sausage, peas, tomatoe sauce, cream & cheese) I had with housemade Pappardelle instead, Matteo's suggestion, and it was great. My husnand had veal saltimbocca which was perfectly seasoned and cooked. We thoroughly enjoyed our two hours there before the play! Authentic Italian cusine. Eric, our server, was fantastic and helped make out dinning experience most enjoyable. Wonderful dinner before a show at the theater across the street.